Pocherong manok or chicken pochero is a tomato sauce based chicken stew with vegetables like cabbage, Bagiuo beans and pechay. Actually this dish is a chicken version of the original pochero that uses pork. If you happen to run out of ideas cooking chicken, I guess chicken pochero is a good dish to try. Since this dish has lots of vegetables, it is a healthy dish and not only that, it is very simple to cook it. Is you can cook chicken adobo, then cooking this dish is a breeze. Pocherong manok or chicken pochero is a tomato sauce based chicken stew with vegetables like cabbage, Bagiuo beans and pechay. Cut the chicken into serving sizes. Fry the bananas and set aside. In a pot, saute garlic and onion in 1 tsp cooking oil. Then add the chicken and stir-fry for at least 3 minutes. Add the saba and sweet potatoes then cover and let it simmer. After 5 minutes, add the tomato sauce, water and catsup, and cover again and simmer. Add the baguio beans (and chorizo) and when it is already cooked put the cabbage and pechay (and garbanzos). Season with patis, salt, pepper and sugar according to your desires taste. 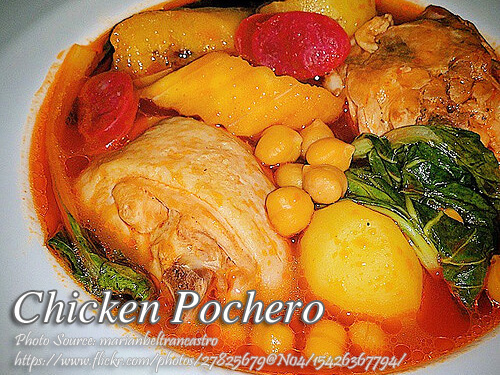 I didn’t know that you can also make pochero using chicken. I thought only pork can be used. Hi Rachel, you can also use beef aside from chicken in cooking pochero. Is it ok if i used pechay baguio? Hi Maria Lenie, yes you can use pechay baguio as per your preference.